My raven of many colors has had his wing wrap removed and has been placed in the outside raven mew. 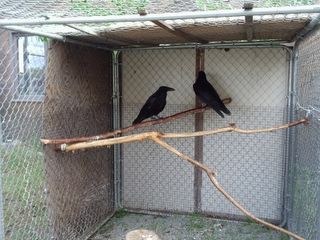 Here he'll be able to get his strength back and enjoy the company of other ravens. Here's hoping he can be released this summer. Did you know that it's believed that if less than 6 ravens lived in London Tower, the British Monarchy would fall? We got two.